Figure 1. Urediniospores of the stripe rust fungus. 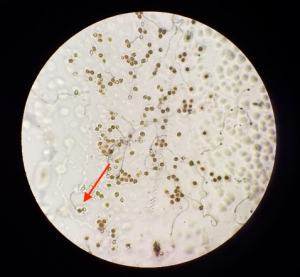 Red arrow indicates a germinating, viable spore. On March 29, 2017 the Field Crops Pathology Team observed the first signs of stripe rust in Wisconsin for the 2017 field season. Plots were located in the Wisconsin Winter Wheat variety trial in Sharon, Wisconsin. A sample was brought back to the Field Crops Pathology lab and placed on water agar to test for spore viability. The red arrow in figure 1 points toward a germ tube extending from the base of a urediniospore, indicating a viable spore. Very low levels of disease incidence and severity were detected in the plots scouted (Fig. 2 and 3). It is speculated that the pathogen that causes stripe rust overwintered on wheat leaves that remained green through the winter of 2016/2017. These same plots were scouted and confirmed to have active stripe rust infection this past fall (Fall 2016). 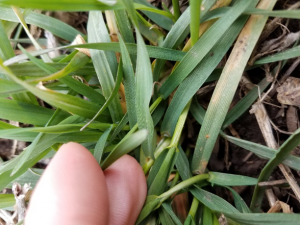 However, application of fungicide was not recommended because stripe rust typically does not overwinter in the northern U.S. To our knowledge this is the first time that overwintering of the stripe rust fungus has been observed in Wisconsin winter wheat fields and is likely due to the mild winter season. Figure 2. A single pustule of the strip rust fungus on a wheat leaf. Stripe rust of wheat is caused by the fungus Puccinia striiformis. Stripe rust can be identified by orange/yellow pustules that typically occur in a striped pattern on the surface of the wheat leaf. However, under low severity, single, or very few sparsely spaced pustules may be observed. Subsequent infections can arise from a single pustule as seen in Figure 2. Disease is favored by prolonged periods of rain (or dew), high relative humidity, and cool temperatures ranging from 50 to 60 ºF. For more information visit the USDA Cereal Disease Lab website. Management of stripe rust includes using resistant cultivars and applying fungicides. Although it is too late to make decisions on a cultivar, scouting should be prioritized to fields where you know there was a susceptible cultivar planted. Considering the early start to the stripe rust epidemic, careful and frequent scouting will be critical this season. 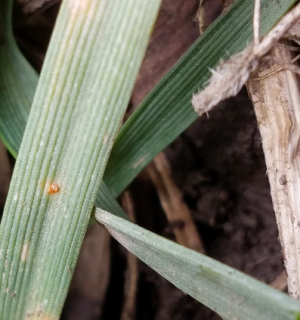 If stripe rust pustules are observed, consider sending samples to the University of Wisconsin Plant Disease Diagnostic Clinic for positive identification. If stripe rust is confirmed and it appears to be active, a fungicide application might be necessary. Figure 3. Low incidence and severity of stripe rust on winter wheat. While we typically don’t recommend an application of fungicide at the Feekes 5 growth stage, an application might be necessary this season if you find stripe rust in your wheat stand. This fungicide application could be tank-mixed with your last herbicide application. You should scout prior to this treatment, as it will only be necessary if active rust is observed. Products labeled for control of stripe rust can be found in publication A3646 – Pest Management in Wisconsin Field Crops. Many fungicides are labeled with excellent efficacy on stripe rust. So, find a product rated excellent, that also fits your pocketbook. Finally, remember to stick with labeled rates. Get out there and scout!